The Ourika Valley in the Atlas Mountains just south of Marrakech, Morocco. I returned to the riad dining room for breakfast, the joyous atmosphere from the previous night still lingered as morning light filtered in through the wooden lattice work over the windows. Marcie, Brigid, Brenden and I put down a couple cups of coffee and hit the road. We drove through the New City, with its stretches of shops, cafes and housing blocks, which eventually gave way to vast desert expanses. 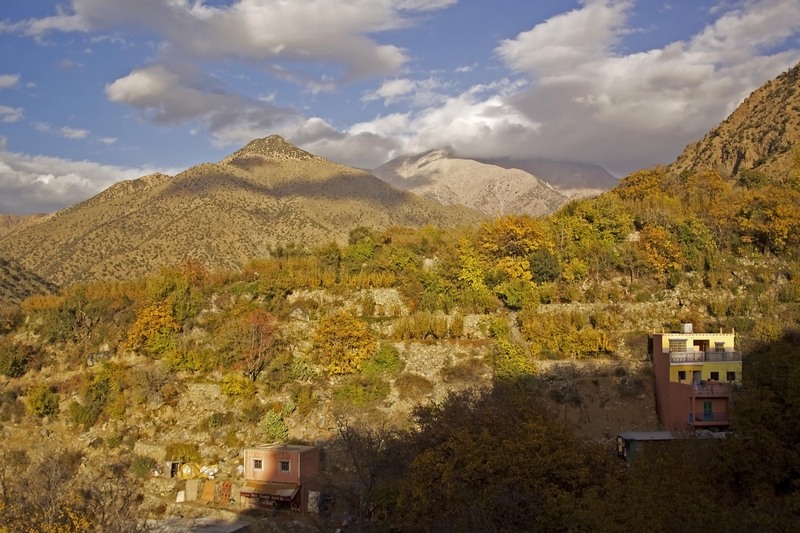 We were heading to the Ourika valley and into the Atlas Mountains. This range of monumental peaks, which separates this region from the Sahara Desert to the south, is home to the Berbers. These indigenous people are concentrated in Northwestern Africa, and with a unique heritage, culture and language, they play a vital role in the defining this part of the world. They are a most gracious, hard working group of folks that have carved out a most admirable life in this less than hospitable terrain. The landscape around Marrakech is stunning, spanning from dusty, desert plains to rugged alpine settings in a matter of a few kilometers. We drove along a beat up two lane road into mountain foothills. Cruising past small outposts of civilization along our route, the roadside was dotted with dingy clay structures, decorated with bright red Coca-Cola banners and handmade ceramics, hoping to attract any passers-by in need of a quick respite along their way. Pulling off the road into a small dirt lot , we arrived at our first stop. We were going to have a tea party – Berber style. The family ushered us in with all the hospitality that one could bestow on a group of visitors. The unassuming facade of the home revealed nothing of the true grandeur of this complex. It was an expansive place that housed three generations of family members and a menagerie of farm animals. Mint tea is an ever present element in Moroccan life, and we were being treated to this delicacy in its natural habitat. Fatima, the eldest woman of the family, prepared this offering for us on an open air patio that overlooked miles of wilderness just beyond her walled off backyard. She stuffed heaping handfuls of the bright green leaves into pristine silver kettles. The amount of mint plunged into the vessel seemed excessive to me, but what the hell did I know about anything going on here? Nothing. As the tea steeped for a few minutes, Fatima, with a face of deep wrinkles and deep brown eyes, surgically knocked chunks off of a large molded cone of the pure, uncut cane sugar with a decorative brass pestle. You cannot have mint tea without loads of sugar. The issue is non-debatable. This sweet ingredient is a prized commodity around here, cherished enough to be offered as a gift to prospective in-laws during courtship formalities. Fatima pours a dab of tea into her glass and takes a few discerning sips. She assertively nods. The brew is ready, and she begins to dole out the steaming treat. She raises and drops her arm in mid-pour, making a thin, sharp arch into each cup, producing a bubbly layers in the glass. I am a bonafide coffee junkie, hopelessly and happily addicted to all things related to it, but this tea, this simple combo of hot water, leaves and sugar, is a divine treat that will make any die-hard espresso lover’s eyes roll back in their head. 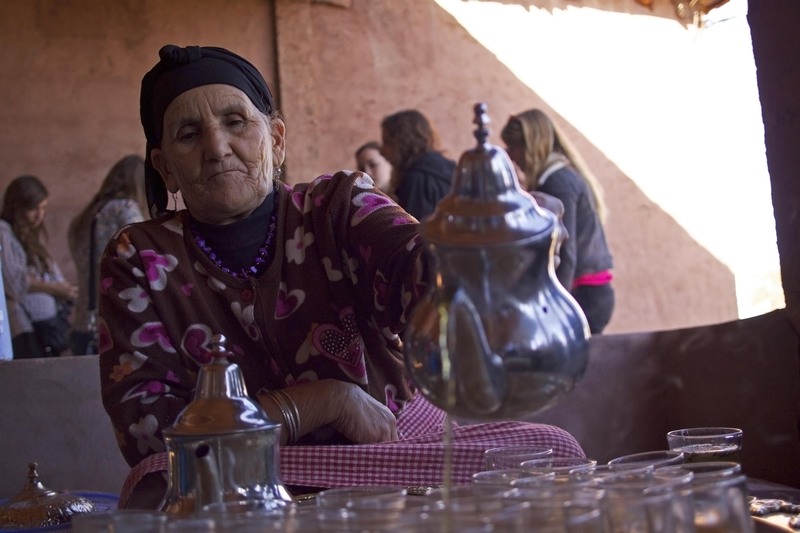 Fatima, the eldest woman of a native Berber family in the Ourika Valley, prepares mint tea for visiting American students at her home near Marrakech, Morocco. Everyone pitches in around here, and that includes entertaining the out-of-towners. While Fatima served mint tea, her young granddaughter set up a henna station; ready and able to apply the ornate, semi-permanent skin decoration on anyone who was game. She was instantly swarmed by nearly every female visitor on the estate. She was banging out intricate patterns like clockwork, effortlessly laying down designs on arms, hands and faces. No two designs were alike. This quiet, shy girl who was helping grandma entertain the visitors was a sensation, and she couldn’t have been more humble about it all. The modesty and graciousness I saw with this family was echoed in many other Moroccans I met during my trip. This outpouring of courtesy was simply customary for these people. They displayed a natural grace that, in return, humbled me. They welcomed us in, took really good care of us and sent us along our way; much better off than when we arrived. Advancing further up the road in our van, we reached our final stop in Setti Fatma. It is a small village of pastel colored, flat top buildings packed in tight between steep mountain pitches. We will be hiking up these very slopes later today, but right now we’re hungry. We stopped at a little restaurant with a breezy patio that overlooked the Ourika River. And situated on a rocky bed in the middle of this shallow, babbling river was a small section of tables. Of course, that’s where we sat. I mean, why wouldn’t you? A two-piece berber band played and smiled while we ate. I was smiling too. Here in the valley, the simple practice of lunch confounded any previous idea I had of a midday meal. It was yet another formerly unknown treat to be found here. I took a deep breath and realized, at that exact moment, I was basking in the sun, indulging in lamb tagine, the water trickling under my feet beneath the table, while being serenaded with ancient, local music. I couldn’t put words to the scene. This is how you do lunch in Morocco. 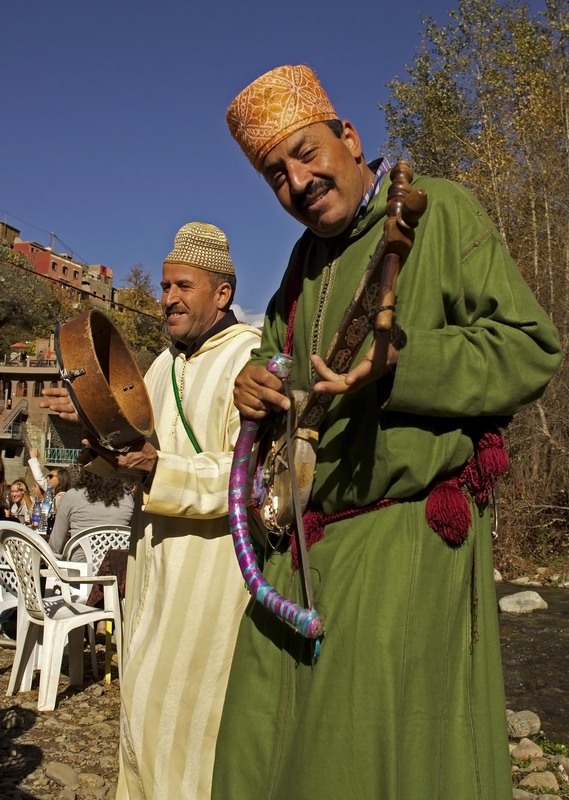 Local berber musicians perform at a creekside restaurant in the Ourika Valley near Marrakech, Morocco. We were now ready for that hike and we set out up the the main, and only paved, street in town to the trailhead. Gaining altitude on the narrow path leading up the foothills, we passed little souvenir tents and restaurants. They were literally tucked into the hillside along this rugged route frequented by adventurous tourists and locals alike. Eventually we were above the reach of the mom-and-pop shops and hiking along craggy ridgelines. The view of a the valley below, and a delicately cascading waterfall, was worth every step. As the sun descended, and the shadows grew long, we made our way down into the village and back to the big city. Marrakech crackles with energy, and trolling around the city center at night is something you don’t soon forget. Jemaa el-Fnaa is the largest gathering point in the city, and one of the biggest squares in all of Africa. The atmosphere here stands your hairs on end and sends a surge right through your spinal cord. It is a barrage on the senses where the tribal drum beats of street performers can be heard all around as a smoky fog hangs over a sea of people. Pools of deep shadows form around brightly illuminated produce stands and pop-up eateries. Wafts of a million different scents tempt my palate as I snake and shuffle through the maze of food trucks, mobs of people and hustlers selling cheap cigarettes. There is no shortage of words to describe Marrakech, but you will never hear anyone say, “Oh look at that honey, it reminds of back home.” No, it doesn’t. It shouldn’t. This place is the only one of its kind. The vulnerability of being at the mercy of an entirely new environment can be endlessly entertaining, pulse-pounding and even spooky. It’s like being a child again; which is consistent with my behavior most of the time. Nothing here is mundane, everything is new to me and I don’t think I wanna go home; not yet at least. I am a multimedia journalist, traveling and searching for new insights into the the human condition and sharing the stories of the people I meet along the journey.